The Doctors of Atlanta Oral & Facial Surgery have been providing specialty surgical services since 1980. Over the years the group has had various names, but the core set of Doctors has stayed together. 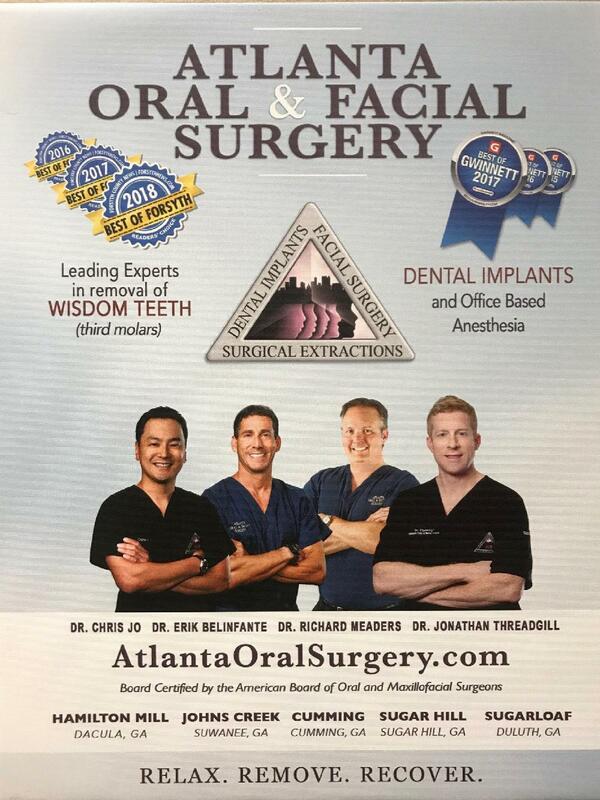 In 2001, the group consolidated its ownerships and formed one company, Atlanta Oral & Facial Surgery. Our surgeon’s core values of surgical excellence and patient safety were coupled with an ambitious plan to provide those services to as many patients as possible. In order to realize this goal, two unique clinical strategies were adopted. The first was to participate in as many insurance plans as possible for the communities being served including Medicaid. The second was to remove as many administrative duties from the surgical offices as possible. This strategy allowed AOFS to both become a patient advocate in sorting out the complications of oral surgery insurance, which often involves dental and medical coverage, as well as to empower the surgical offices to focus on patient comfort & safety, and referral doctor communications. With this strategy in place, AOFS consolidated our 7 offices and began a campaign to vastly expand its service to patients throughout Atlanta. By 2012 AOFS had grown to 21 oral surgery offices, one plastic surgery office, and 19 doctors, easily becoming the largest oral surgery group of its kind in the United States.During this time of growth, AOFS surgeons continue to maintain their surgical excellence and work closely together to provide effective surgical techniques with the latest in technological advancements. With a referring dentist network of over 2500, AOFS is instrumental in promoting key elements of Patient Standards of Care. In recent years they have shown the surgical justification of 3-dimensional x-ray, and promoted the advantages of dental implants. Today AOFS assists referring dentists place thousands of dental implants each year.Dental School: Boston University Goldman School of Graduate Dentistry Residency: Catholic Medical Center, Brooklyn and Queens, NY Fellowship: Facial cosmetic surgery, Dental Implants, and TMJ surgery Surgical Interests: Wisdom teeth, Dental Implants, Pediatric patients Dr. Erik Belinfante grew up in Sandy Springs, a suburb of Atlanta, Georgia. He obtained a Bachelor’s of Science in Microbiology at the University of Georgia. Dr. Belinfante received his dental degree from Boston University, and performed a year of oral and maxillofacial surgery internship at Boston University/Tufts University. He then completed a year of residency of general anesthesia at Metro Health Medical Center in Cleveland, Ohio before obtaining his certificate in oral and maxillofacial surgery in Brooklyn and Queens, New York While in training, Dr. Belinfante was elected National Chairman of the Resident Organization of the American Association of Oral and Maxillofacial Surgeons. Dr. Belinfante then performed a Fellowship at Louisiana State University in TMJ surgery, cosmetic surgery, dental implants, and general oral and maxillofacial surgery. He is board certified by the American Board of Oral and Maxillofacial Surgeons. Upon completion of his formal education, he decided to return home to Georgia. He joined Atlanta Oral & Facial Surgery in June 1999.
my 13 year old son had to have some baby teeth. we went in for a consultation and right away we were comfortable. the day of surgery was a breeze, my son was so comfortable goin to sleep, that when he woke up, he asked if they were done. he didn't have any discomfort and was so happy. dr. Belinfante and his staff are awesome. if we have to have any other teeth extracted we will always have dr. Belinfante do the job! About Front Desk: great friendly ladies. very helpful and knowledgeable, always have a smile on their faces. Dr. Belinfante did a great job on my dental implant. The procedure was painless. I will definitely use him again for any surgical needs and recommend him to all my friends! Dr. Belinfante has also worked on everyone in my family and they all had a great outcome as well. Very relaxed atmosphere that eliminated stress of having dental work done. Everything was painless and the staff took care of all insurance issues and follow-up. Highly recommend. About Front Desk: All the staff was helpful and listened to any and all questions. Erik is a family member but had never used his services and heard from others what a great job he had done for them so flew in from out of the country to have dental work done. Very pleased. Went to Dr. Belinfante with an extremely impacted wisdom tooth. After my surgery my recovery was far quicker than expected, with very little pain, amazing recovery, credited to Dr. Belinfantes great work. Dr. Belinfante was professional and very proficient with a great patient contact attitude! About to take my son to him to have wisdom teeth removed! A quack. I got my wisdom teeth out and because of him got an infection and dislocated jaw. Dr Belinfante repaired damages imposed by a different surgeon on my daughter about 6 years ago. He then removed wisdom teeth on a second daughter and later on my son. They have had remarkable recoveries with no complications. I moved from Georgia a month ago, and I am driving from North Carolina so he can remove the wisdom teeth for my youngest daughter. Dr. Belinfante is the best in his field. Dr. Belinfante was excellent! He operated on my son. Procedure went well and my son was fine within minutes! Highly recommended along with his staff! !